The mill was built in the early 1600''s and has been beautifully restored along with our gite “L'Hirondelle”, to a very high standard. The buildings are set around a large gravelled courtyard that is entered through an electrically operated security gate making the grounds safe and secure. With children in mind we have ensured that there is no direct access to the millpond or river. Saint Philippe du Seignal is only 5kms from the bustling Bastide town of Ste Foy-la-Grande, which offers no fewer than 4 large supermarkets. There is also a good range of shops, restaurants and bars as well as an excellent local market every Saturday. Drive through lovely rolling vineyard scenery to the famous Chateau de Monbazillac and the lively market town of Bergerac. Just a few kilometres from the Mill is the famous golfing haven of Chateau des Vigiers with more challenging courses at Medoc (north of Bordeaux - 55 minutes). Cycling and rambling are pleasant pastimes more or less year round in this area, and of course the wine-lover is more than adequately catered for with wine-growing Chateaux sign posted at seemingly every minor crossroad. The 100 years war was ended in nearby Castillon-la-Bataille (20 minutes away) - and the French celebrate this every year with mock battles! Discover the history of the area from the 100 years war by visiting this web-site. Bordeaux is easily accessible by road or rail. 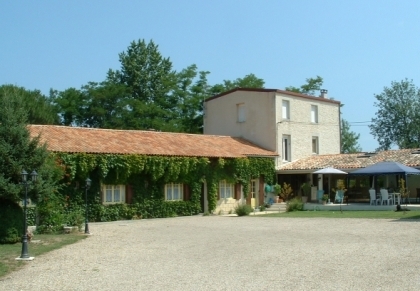 Visit the web-site below for all the information you should need to enjoy a visit to Bordeaux. Arcachon on the Atlantic coast, just half and hour south of Bordeaux, has the largest sand dune in Europe. It offers spectacular views from the top across the bay and is famous for oysters and mussels. Great surfing beaches too. Getting to us is easy. Ryanair/Flybe offer flights to Bergerac (about 18Kms), and Bordeaux (about76Kms), from many UK airports.